NASA'S Mars Exploration Rover Spirit captured this westward view from atop a low plateau where Sprit spent the closing months of 2007. 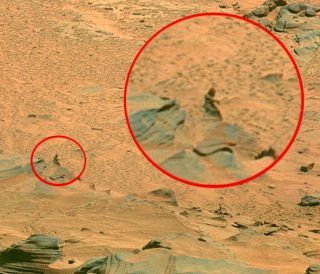 Several bloggers and other enthusiasts have pointed to a tiny structure (red circle) on the Martian surface as a human figure and thus evidence of life on Mars. The idea that there may be life on Mars has been around forcenturies, but the theory got a dubious boost from recently released photos ofthe surface of Mars (taken by the NASA robot Spirit) apparently showing ahuman-like figure. Several Internet sites have glommed onto the image andsuggested the figure could be alive. But what is it? Just a rock, astronomers say. It's hard enough to accurately recognize figures and facesacross the room. Mars, depending on when you measure it, is about 35 millionmiles away. The best telescopes aren't of much help in determining surfacefeatures, and that's why NASA sent robots with cameras to Mars. The reason many people see a figure on the Martian landscapeis the same reason that people see faces in clouds, Rorschach blots, and coffeestains. This phenomenon, called pareidolia, is well knownin psychology, and it is the cause of many supposedly mysterious and miraculousevents (including the famous "Jesus in the Tortilla"). Examples areall around us; in fact if you have a New Hampshire state quarter, you have pareidolia in your pocket or purse (take a look). Strong evidence for this psychological explanation lies inthe fact that the Spirit image does not look like Martian life (since we don'tknow what life on Mars looks like), but instead resembles life here on Earth,specifically human life. The image is the result of human interpretation. Ifyou look around the full image of the area (not just the close-up), you willfind several rocks and features that resemble non-human Earth life, such asarmadillos and snakes. In the right bottom corner, emerging from the sand,there is what looks like a lizard face wearing goggles and an airman's helmet. This is of course not the first time that NASA images havebeen claimed to show evidence of Martian life. A man named Richard Hoaglandclaimed that 1976 photographs of the Cydonia region of Mars showed a human-likeface and was clear evidence of aliens. According to astronomer Phil Plait of the Bad Astronomy Website, if the image really is of a man on Mars, he's awfully small: "Talkabout a tempest in a teacup!" Plait said. "The rock on Mars isactually just a few inches high and a few yards from the camera. A few millionyears of Martian winds sculpted it into an odd shape, which happens to looklike, well, a Bigfoot! It's just our natural tendency to see familiar shapes inrandom objects." Even though logic and science suggest that the image is of arock and not an animal, UFO buffsand conspiracy theorists will continue to speculate. In fact, it will actually be pretty easy to determinewhether or not the image is of alien life. In later photographs of the area,either the same shape will be there or it won?t. If it is, it's a rock (unless,of course, little Martian men can hold the same pose for weeks or months at atime). This is exactly how the "Face onMars" was eventually disproven. On April 5, 1998, the Mars GlobalSurveyor took photographs of the same region in far higher resolution than waspossible in 1976. The new images clearly showed an area heavily eroded, andthat the "face" was simply the result of low image quality, pareidolia, and tricks of light and shadow. Hoagland's theorywas discredited. Just don't tell that to the creepy, goggle-wearing Martiansand lizard. Benjamin Radford is managingeditor of the Skeptical Inquirer science magazine. He is authoror co-author of three books on skepticism and science literacy. They can befound on his website.